Isn’t this awesome? And they really caught a flavor of both Verity and Rhys. Here’s the blurb: This book will now come out on September 4th. After hearing that Vampires have returned to the court of Henry VIII, Rhys Williams must form an unwanted alliance with Verity Llewellyn, a lady-in-waiting to the new queen. His childhood companion has grown into a clever and beautiful woman, but she is completely untried as a Vampire hunter. The revelation that the queen is pregnant only makes the situation all the more dangerous. Who is systematically draining her blood and how, without being noticed? 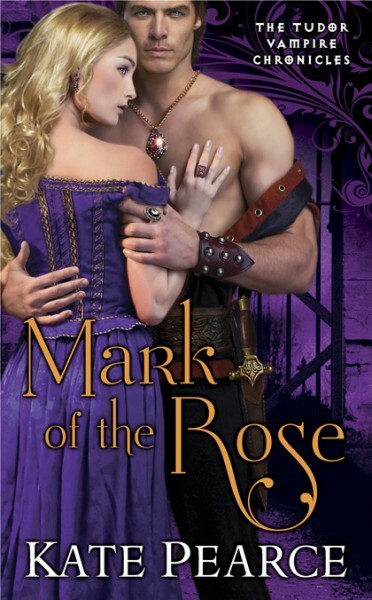 As Rhys and Verity work together to untangle the mystery, the battle to save the queen and the heir to the throne heats up—as does the uncontrollable passion between them. Fantastic cover! Looking forward to reading it! AHHH OMG! I LOVE it! And I absolutely want to read it NOW! Especially after getting the preview at the end of Blood of the Rose! Kate, you’ve gotten some awesome covers! Beautiful! 😯 Holy moly, that’s gorgeous! It fits right in with the others. Kiss of the Rose is still my favorite, but all of them are striking. Congratulations on the covers, Kate!